Two weeks ago, I flew to Columbus/Ohio, to visit my daughter. In my carry-on I had a freezer bag with sourdough, hoping it wouldn’t cause suspicion and confiscation at the airport security. 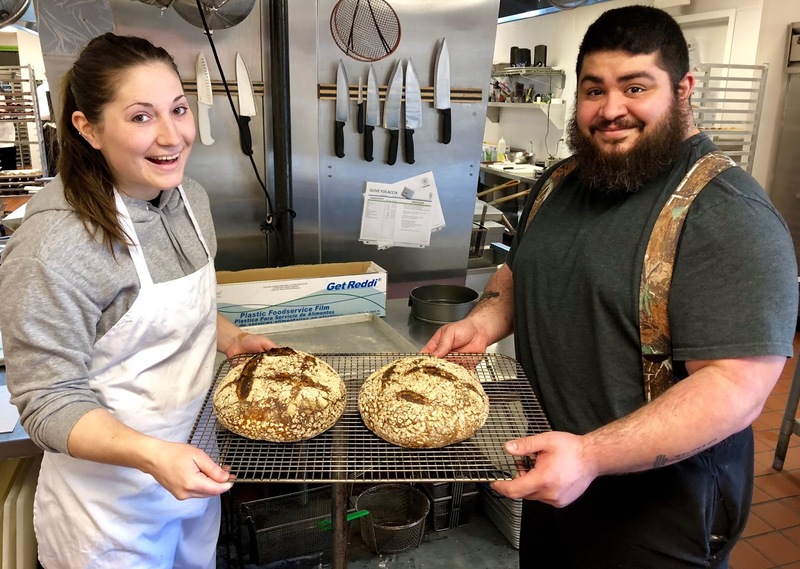 Valerie had asked me to show her and her co-workers at “Two Caterers“, how to bake a high hydration bread à la Chad Robertson of Tartine fame. “Tartine”-breads are known for their “holyness”, and their excellent taste. 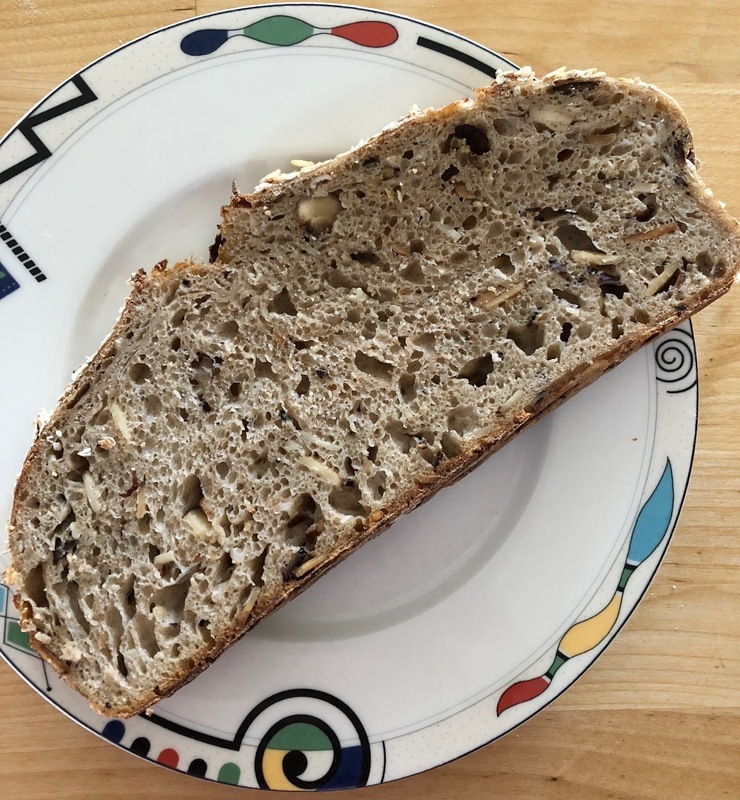 They are great favorites of mine, and I bake them in all possible variations (Brewer’s Bread, Acorn Levain). The next day I walked to a nearby “Giant Eagle”-supermarket to look for ingredients. 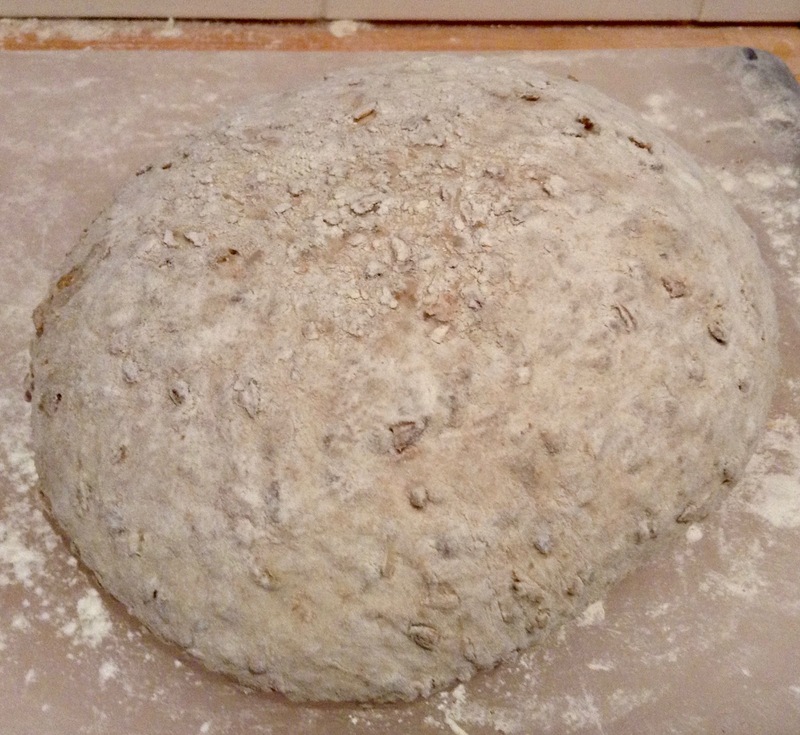 I wanted to bake a porridge bread (the grain mush makes it especially moist). And it should have nuts in it. 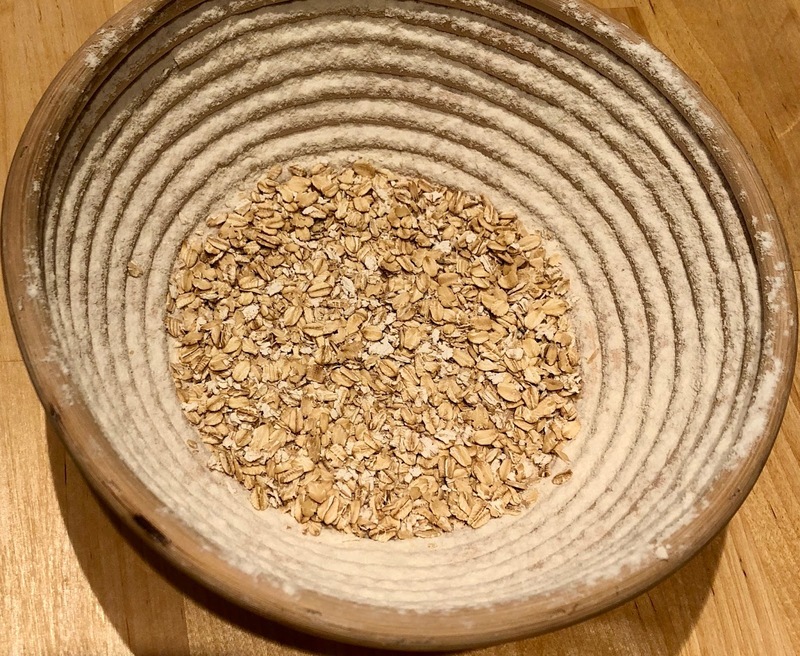 The different flours I needed were easy to find, and, also, rolled oats for the porridge. For the nuts I opted for almond slices. Fortunately, my daughter owned a scale. A polka-dotted salad bowl and a large pot at my little studio Airbnb could serve as mixing bowls. 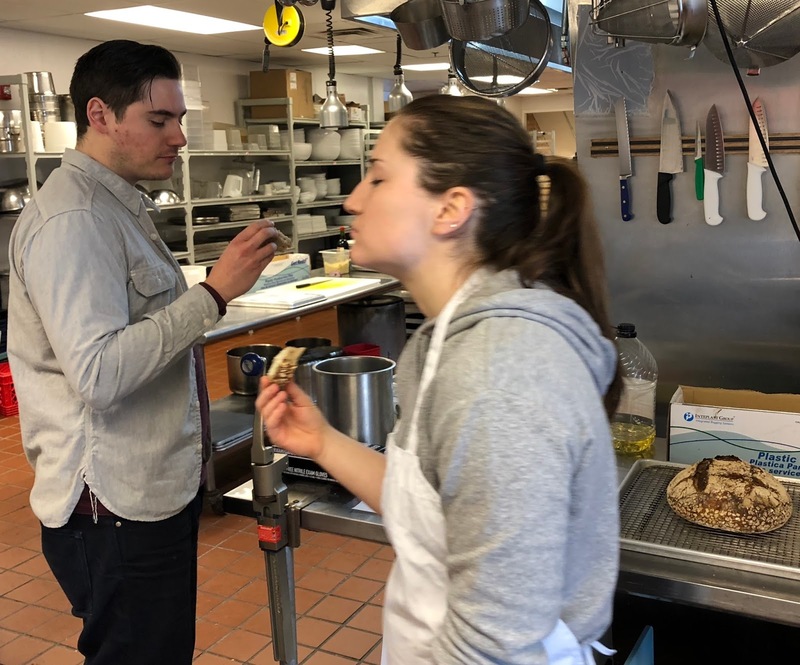 I cooked the porridge, toasted the almonds, mixed the dough, and carried the whole shebang to the kitchen of “Two Caterers“, where, for the next two days, I baked bread with baker Zeek, pastry chef Cheryl, and manager James. And had the chance to peek into pots, pans and woks of all the cooks. Sampling Cheryl’s delicious dessert creations was, of course, strictly for continuing education purposes! 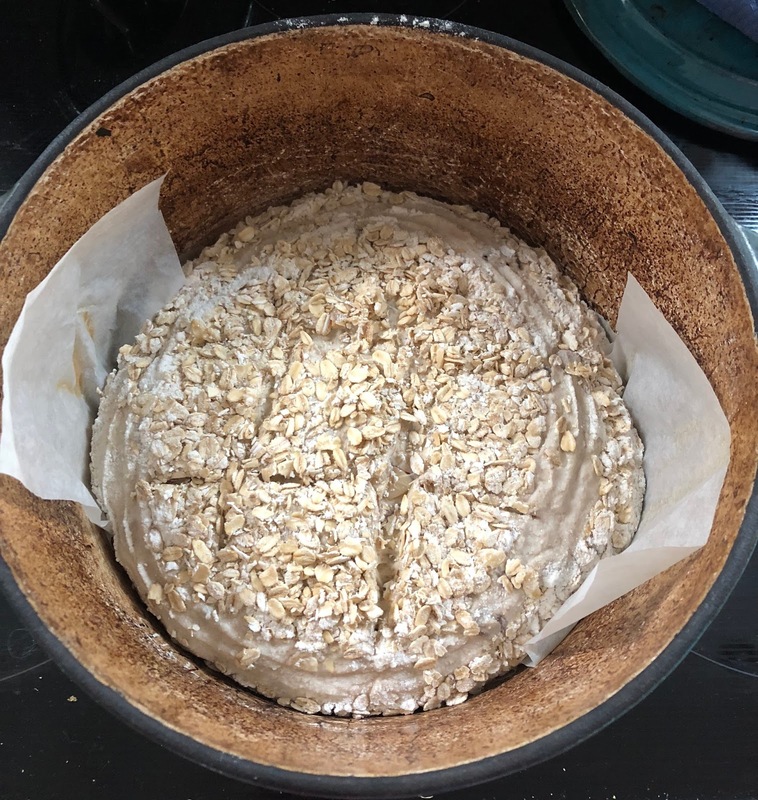 Soon as I got home from my trip, I baked another Oat Porridge Almond Bread for us – it was so delicious. 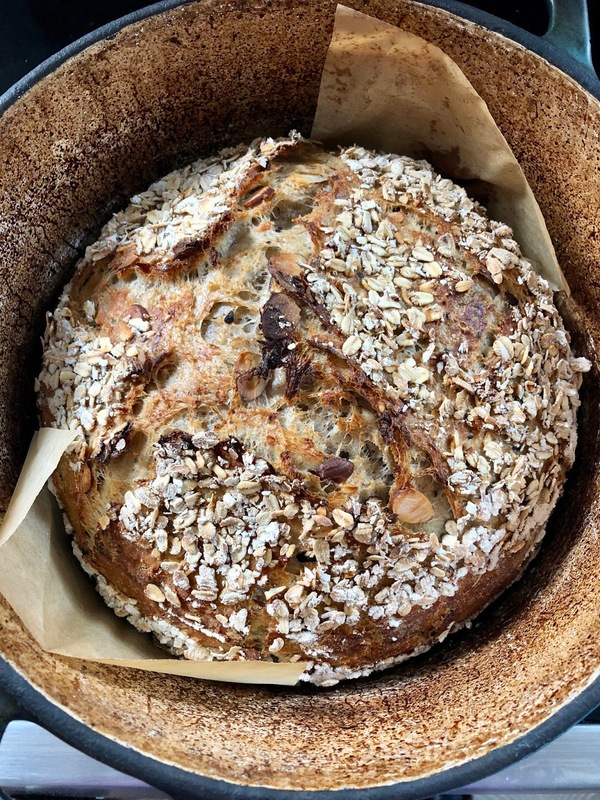 I tweaked the basic formula from “Tartine: Book No. 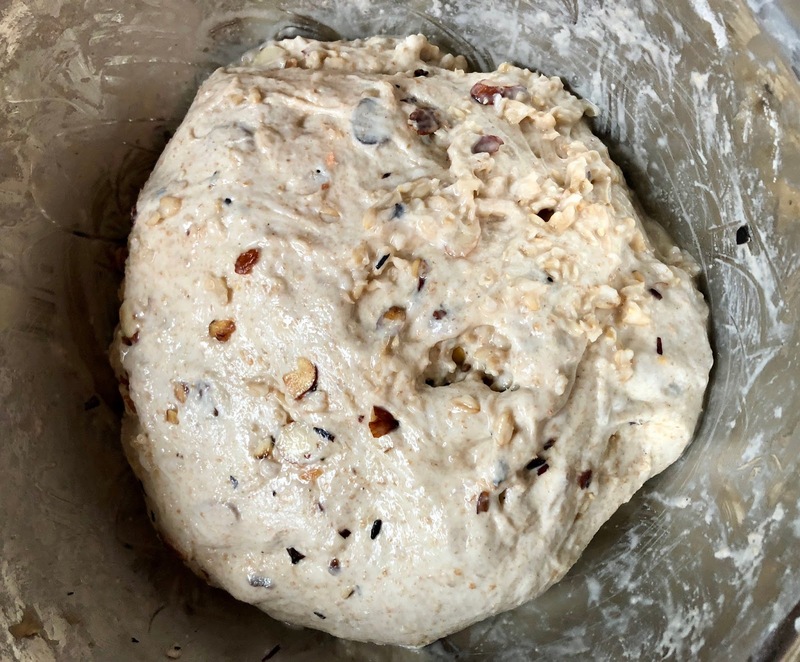 3” a bit, the original contains less sourdough (only a third of the starter, the rest is supposed to be discarded – something I would hate to do) and very mild. I prefer a slightly tangier bread, and use the whole amount. Feed starter 2 x daily (to increase activity). 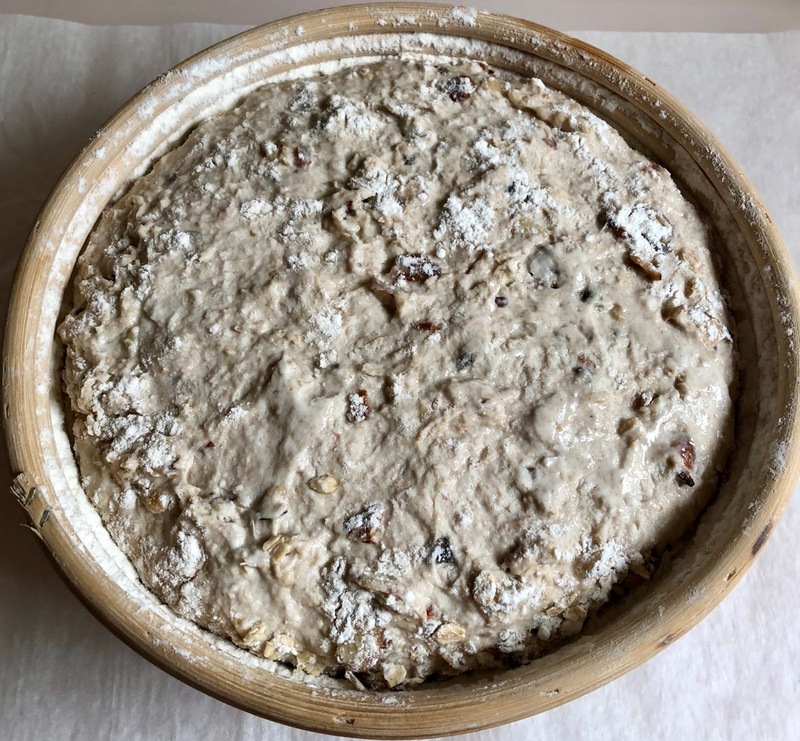 6:00 – 8:00 am: Mix levain. Cover, and leave for 6-10 hours at warm room temperature, or until a teaspoonful starter floats in water (swim test). 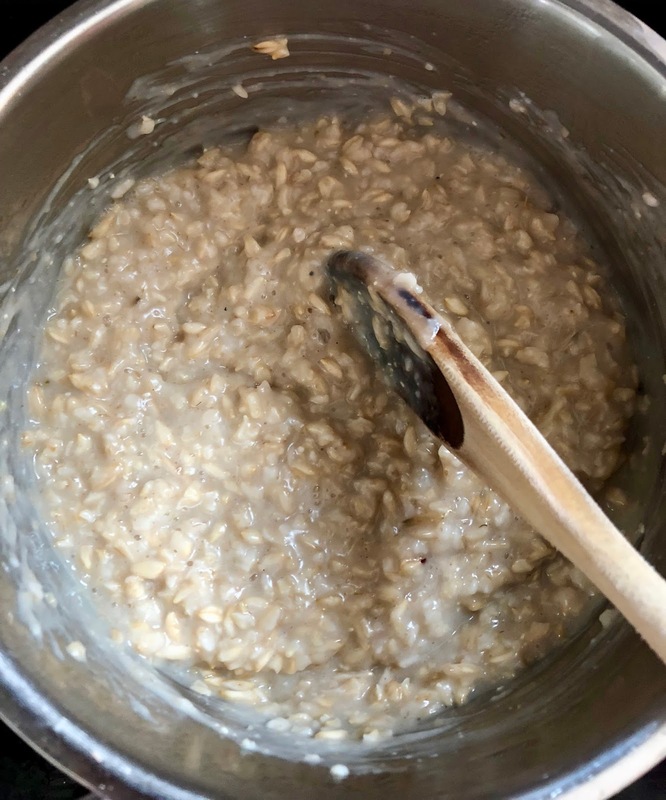 For the porridge: cook oats with 3/4 of the water over low heat, stirring constantly until all water is absorbed. Add remaining water and salt, and keep stirring, until porridge is creamy and soft. (Adjust with a bit more water if needed). Let cool. 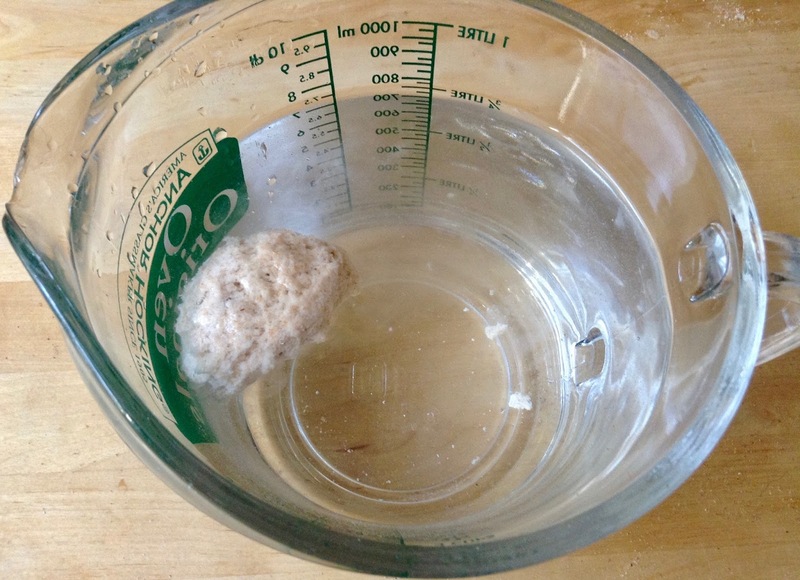 12:00 – 18:00 pm: When levain is ready, transfer it to a large bowl, add 400 g of the water, and whisk to dissolve. 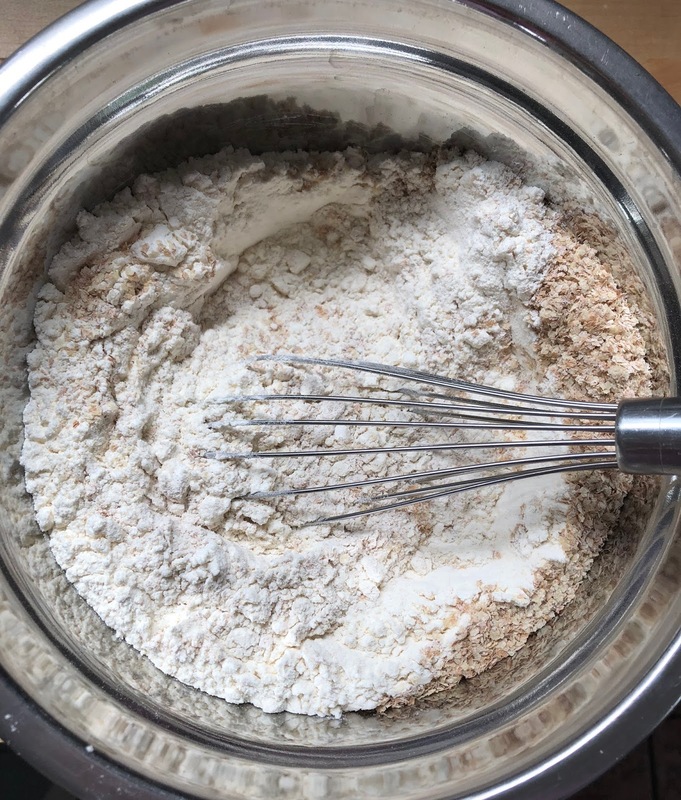 In a second bowl, mix flours and wheat germ. 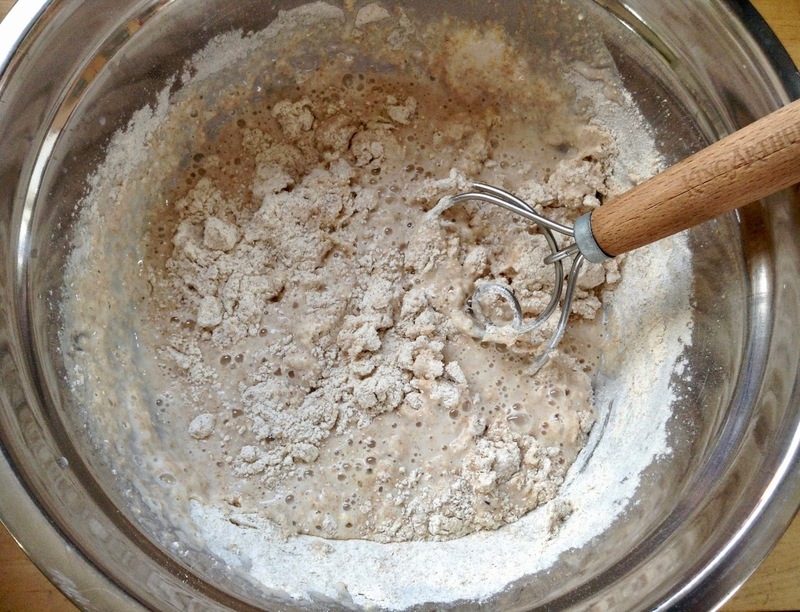 Add flour mixture to dissolved levain and stir (Danish dough whisk, large spoon, or hand) until all flour is hydrated. Cover, and let rest (autolyse) for 30 minutes (and up to 4 hours) in a warm place. Add salt and reserved (lukewarm) water to the dough. 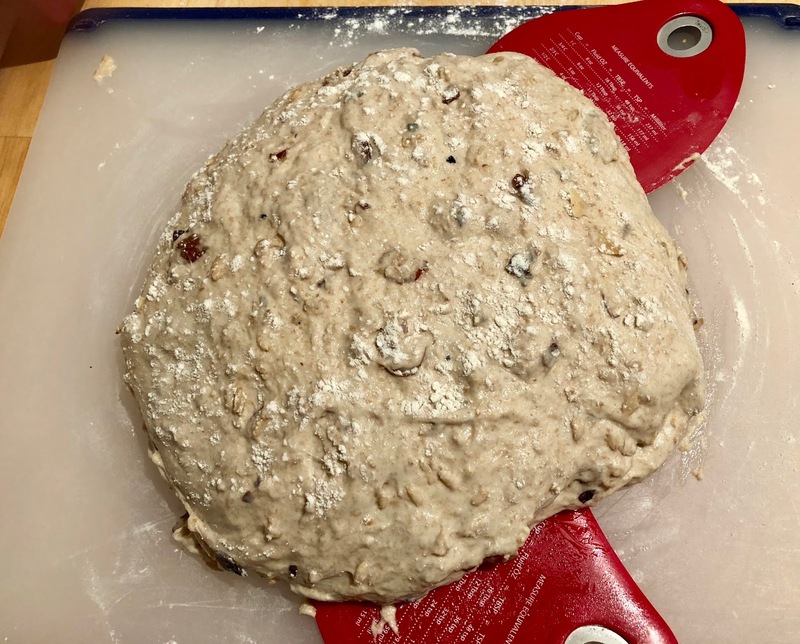 Pinch and fold to combine: using your hands, pull up dough around the bowl, fold it over to the center, then pinch it several times. Repeat pinching and folding procedure until most of the added water is incorporated. Cover, and let dough rest for 30 minutes. 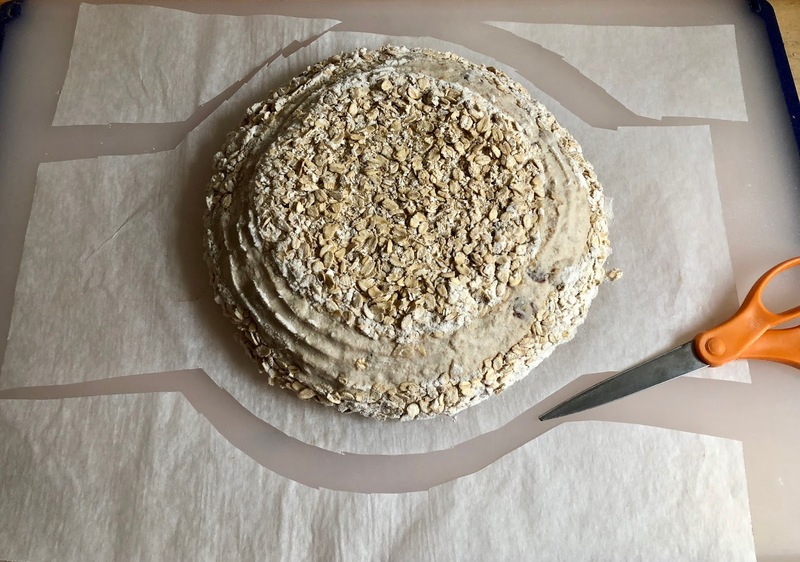 Stretch and fold it, leave it for another 30 minutes, then add porridge and toasted almonds, pinching and folding 4-6 times, until roughly incorporated (see above). Transfer dough to floured work surface. Lightly flour top. Using oiled spatula(s), work into a round by drawing the spatula(s) around it in circles to create surface tension, while rotating it. 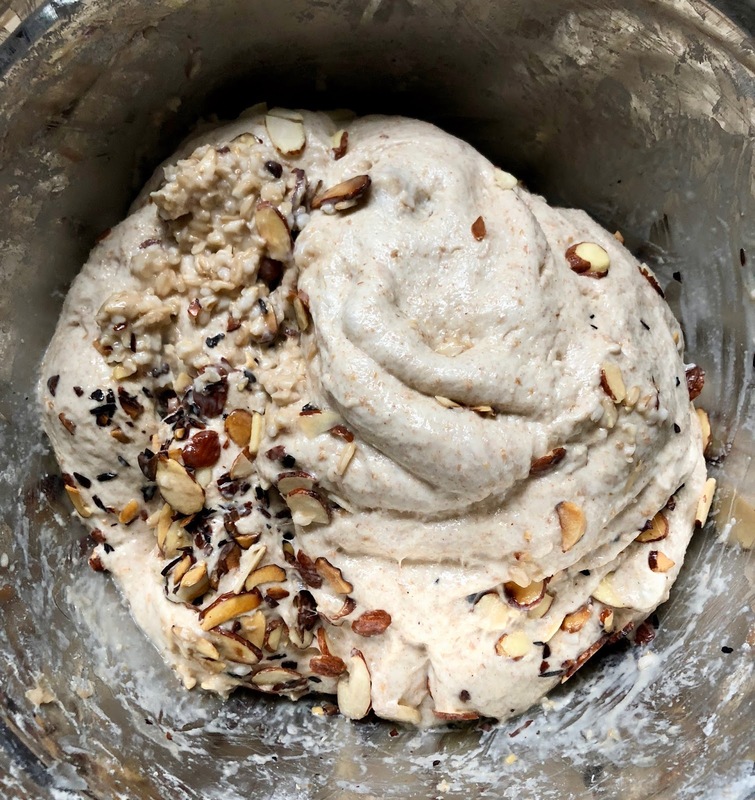 (Dough ball should be taut and smooth). Lightly flour dough ball again, cover (I use the mixing bowl), and let it rest for 20-30 minutes (it will spread out again). Using floured, or oiled bench knife, flip dough around, floured-side down. 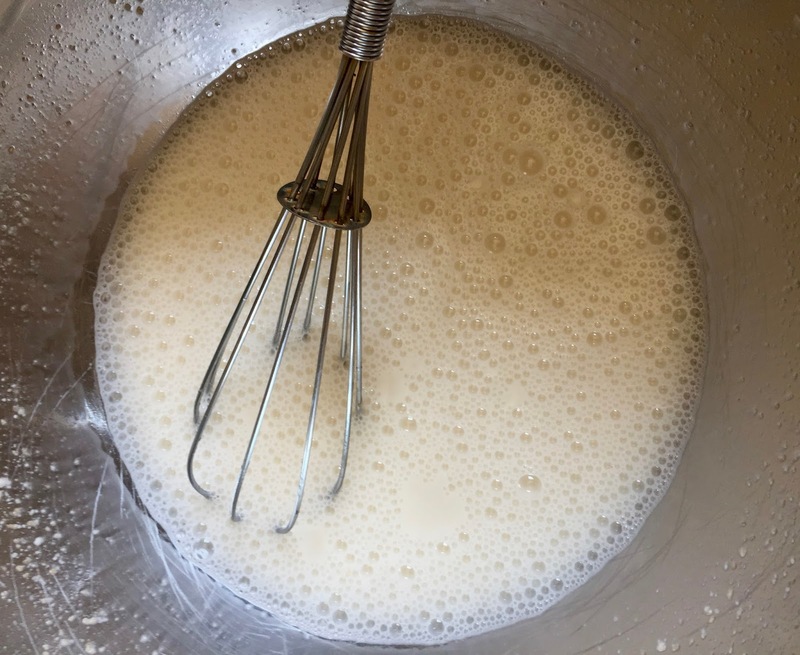 With floured hands, fold up the bottom side by a third, then pull and fold both sides to the center, and the top down to the middle, gently pressing seams to seal. Finally, fold bottom up over top fold, leaving the seam underneath. 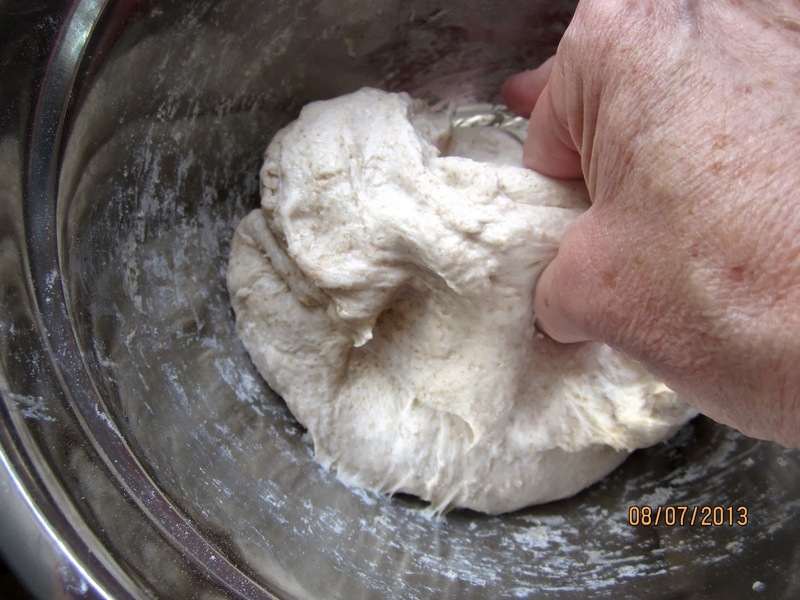 With floured hands, rotate dough ball until taut, dusting it with more flour if necessary. Place it into the rising basket, seam-side up. 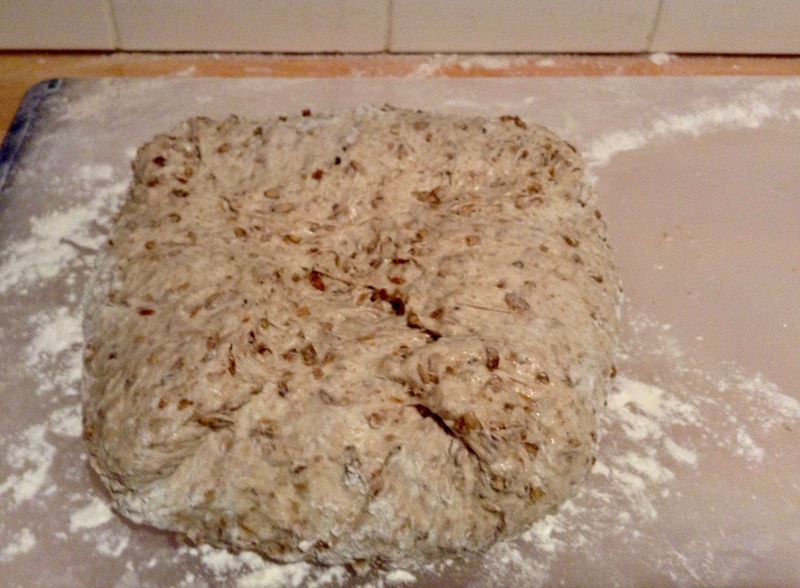 Gently lift dough edges a bit and slide more oat flakes between dough and side of basket (to further prevent sticking). Sprinkle top of dough with flour. Place basket in plastic bag, and refrigerate overnight. (No warming up necessary). Preheat oven to 500ºF/260ºC, with Dutch oven in the middle. Keep a large piece of parchment paper and scissors at hand on your counter. Take hot pot out of the oven, remove lid (I place my oven mitt on top so that I don’t forget how hot it is) and transfer bread with paper sling to Dutch oven. Replace lid. 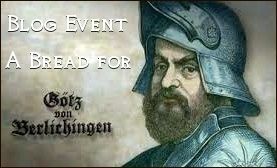 Bake bread, covered, for 20 minutes, reduce temperature to 450ºF/230ºC, and bake for 10 minutes more. Remove lid, and continue baking for another 20-25 minutes, until loaf is deep golden brown and registers at least 200°F/93ºC.